With a new corn cob pipe, you must endure the taste of charred wood as the tobacco burns the shank towards the end of the bowl. While smoking in my garage, I came up with this idea to char the shank without having to smoke it. Get a piece of tubing that will fit over the bit and poke a small hole in the other end to fit the air compressor blow gun nozzle into. When you get near the end of the bowl, attach the hose to the bit and blow air through the hose with the blow gun with minimal pressure. 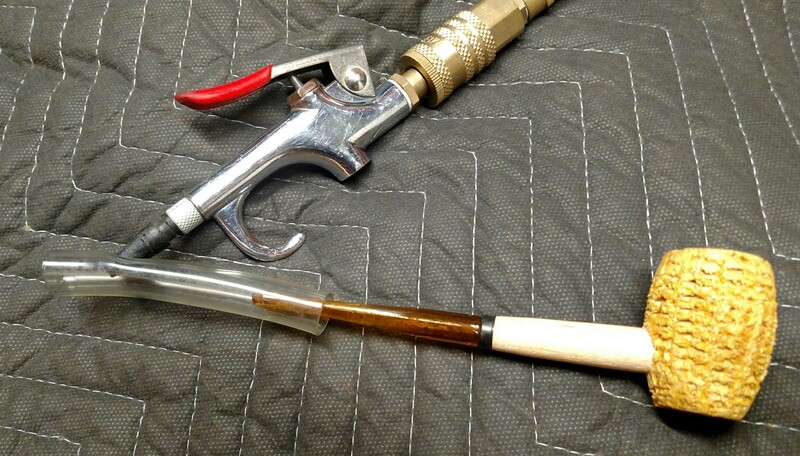 This will cause a venturi effect and burn the tobacco down all the way, charring the shank and saving you from having to deal with the unpleasant taste of burning wood. Go slow so you don't burn up your new pipe. While on the surface, this seems like a really great idea.. one of the more susceptible areas of burnout(and actually the only burnout on a cob I've ever had), is right at the shank/cob junction. This area eventually becomes protected by a layer of cake and carbon, but when a cob is new, there is no protection and really high burn temps can cause a "run" up the edge of the shank through the cob. I would definitely step cautiously. Look, why take a chance? At least that's the way I feel about it. I look at the break in process as a right of passage. After a few bowls of charred wood flavor, the “magic” suddenly happens. 'Noticing that his pipe was very-aged and black, and knowing that he was about to enter a country where corn-cob pipes are not, I asked him if he had brought a supply of pipes with him. "Oh, no," he answered, "I never smoke a new corn-cob pipe. A new pipe irritates the throat. No corn-cob pipe is fit for anything until it has been used at least a fortnight." "How do you manage then?" I asked. "Do you follow the example of the man with the tight boots;--wear them a couple of weeks before they can be put on?" This is great! My cheap man is my compressor. That seems like a lot of effort to go through to char the shank. If that's the case why don't you just remove the shank and char it with a lighter and put it back in with Elmer's glue? I say smoke it and let the science happen naturally.